These sweet little origami strawberries would make great embellishments on cards, turn them into hair clips, pendants or stick them onto toothpicks to use as cake toppers or pop them into cocktails. You can choose from red, dark pink or light pink, they come with black seeds, white seeds, no seeds and also with a space to draw on a face, you can also download a smaller, miniature size too. 1. 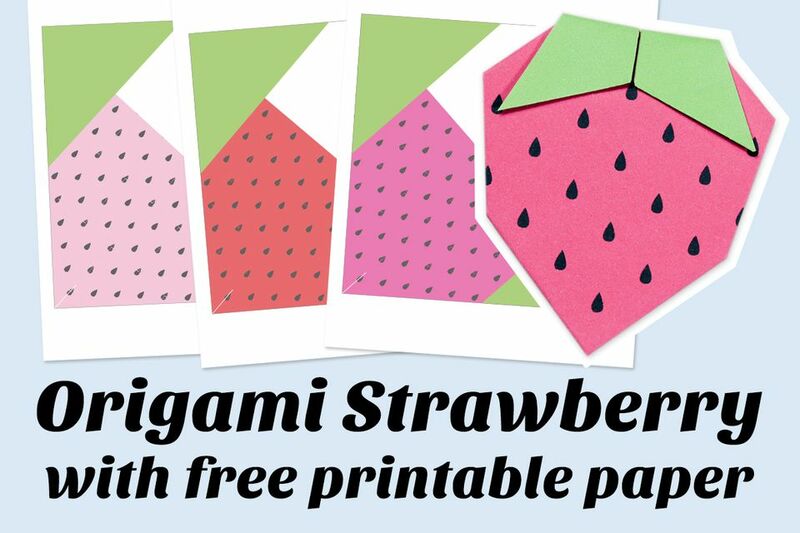 After you've printed out the free strawberry paper, you'll need to trim off the excess paper, you can use scissors, paper trimmer, or craft knife. 2. The two green corners should be to the left and right, with the colored strawberry section at the bottom. 3. Fold the paper diagonally behind so that you are left with no white showing. 4. Fold the left and right green sections up. 6. Fold the left and right edges into the center line. 7. After the flipping over the right 'leaf' to the left, fold the top right edge from the top center inwards a little. 8. Do the same with the left side. 10. Fold the bottom up to meet the green leaves. 11. Fold the right side of the bottom inwards to meet the white center line. 12. Do the same with the left. 13. Now you can flip the model over and fold the leaves down. You can use a tiny bit of glue to keep them in place if needed. In order to make the stand, check out a quick video tutorial, here.